Our Saturday snowshoe plans foiled by frigid temps, I took my favorite fellas (Sig Other, Dad and Nephew) to try the unique Dog é Style Bar & Grill. What resembles giant, stacked, bright blue Hanjin shipping crates creates an interesting structure with an industrial interior of exposed pipes, metal and rough-cut wood. In front there’s a sleek bar and shelf seating; in back, the charcoal grill/kitchen/order counter. Stairs lead to tables up top. While Ted’s, Louie’s et al, have their place, DES barks up a different tree. Using Wardynski products, “house” dogs are jumbo, ballpark-style all-beef or beef/pork dogs. Other menu items use custom-made dogs. Specialty rolls come from Luigi’s Italian Bakery on the West Side. Prices range from $3 for a Lap Dog (a regular Wardynski hot dog) and $4 House Dog to $12 for a Fat Duck Dog, a custom ground duck dog with foie gras, mushrooms and truffle aioli. In between are funky dogs like a Beef on Weck Dog ($5), an all-beef dog with horseradish mayo on a salted, seeded weck hot dog roll, and a Greek Dog ($5.75), a custom ground lamb dog with tomato, pepperoncini, feta and olives. An all-natural Turkey Dog is $4. Also available, sausages: Smoked Pork ($5.50) with hot mustard and caramelized sweet onions and Fresh Italian ($6) with onions and peppers on a garlic roll. A Cheeseburger is $6.50. Extras like chili, cheese, grilled onions, sauerkraut and hot pepper mix are $1.75 extra; $2 for bacon. For non-meat eaters, there’s a No Dog ($4) slow roasted caramelized carrot with vegetarian chili or a Portobella Sandwich ($8) with a fried egg and smoked cheese. Daily specials are offered, like a Pizza Dog, Jalapeno Cream Cheese Dog or a Friday fish fry. The Untubed 14 oz. Steak or the Philly Cheesesteak are budget busters at $15. Decisions, decisions. Our quartet of hot dog connoisseurs painstakingly reviewed the menu. Order at the counter, grab plasticware and condiments then find a seat. Some folks waited for food. Others had it delivered. We went upstairs and checked back. Somehow it works. We ordered four dogs plus a special Rodeo Burger ($7.25), Twice Fried Fries ($2.50) and onion rings ($3). We started with a creamy and spicy bowl of really good Chorizo Corn Chowder ($3.50). Then our mountain of food arrived on two metal baking sheets: one for the dogs; one for the pile of onion rings and fries. “I give us an 8 percent chance of finishing all this food,” the Nephew said before biting into his house dog covered in a spicy, meaty chili ($5.75). Calling the bigger dog “manly,” he loved the toasted bun. Sig Other’s Chi Town ($4.50) was served on a poppy seed bun and covered with “all the fixings” including the signature neon green sweet relish (made in house), dill pickle spears, diced tomato, onion, mustard, celery salt and real Sport Peppers from Chicago. The dog hit all the sweet, salty, sour and heat high notes. Dad’s Nola Dog ($5.50) was gorgeous with ham and melted provolone under a dog topped with green olive salad and two golden, deep fried oysters. A hot dog po’boy. My Banh Mi ($4.50) was a twist on the Vietnamese street sandwich. Topped with pickled vegetables, the sweeter pork dog was deliciously offset by the sweet-sour, crunchy vegetables, cilantro and a hot kick from jalapenos. 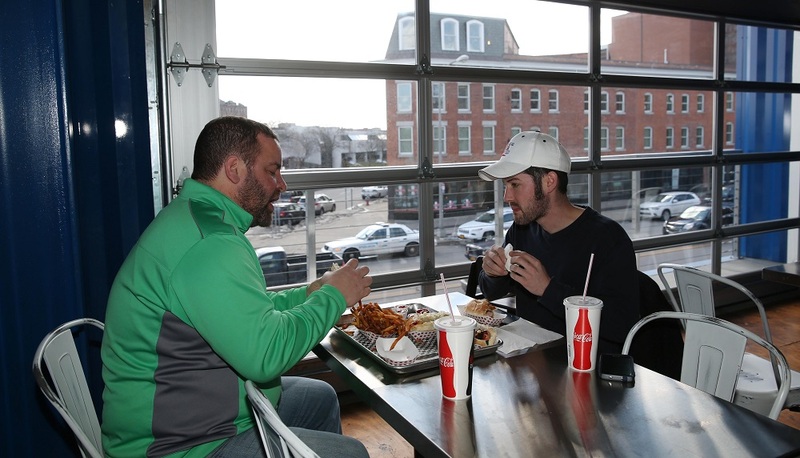 Between dog bites, we packed out gullets with the addicting fresh cut onion rings and fries. Perfectly seasoned, the rings had a nice crunchy coating and the fries were out of this world – a toss up over which was better. We didn’t need the Rodeo burger, but ate it anyway. Juicy, and obviously housemade with not-so-perfect edges, it arrived on a lovely toasted egg bun dripping with homemade queso, barbecue sauce and more onion rings. Hours: 11 a.m. to 4 p.m. Monday; 11 a.m. to 9 p.m. Tuesday through Thursday; 11 a.m. to 10 p.m. Friday; and noon to 10 p.m. Saturday. Extra: Full bar downstairs with craft beers including Big Ditch, EBC and Hamburg Brewing. Chocolate, vanilla or loganberry milkshakes ($4.50) and fountain drinks. Flat-screen televisions on both levels.